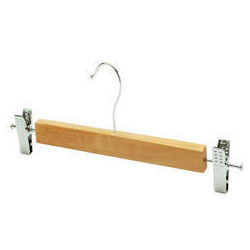 Our company is highly esteemed in offering Kids Bottom Hanger to the clients. Offered range is manufactured using optimum grade material and advanced technology as per industry set norms. This product is rigidly tested by the well qualified professionals on various quality parameters to deliver a flawless range at the client's end. Since its foundation in the year 2005 as a Sole Proprietorship business, Runwal Plast is operating all its business operations from Chennai, Tamil Nadu (India). Our company is one of the renowned manufacturers and suppliers of a variety of products such as Undergarments Hanger, Printed Hanger, Ladies Top Hanger, Clothes Peg, Plastic Hollow Hanger and many more. Our plastic products are used at large scale at readymade garment export houses, commercial places and other allied areas. These products are known for their lastingness, tensile strength, superior quality and high utility value. To keep ourselves ahead in the market comparison to our competitors, we make use of latest technologies and regularly improvise our range. Our facilities help us in taking bulk orders and delivering cost-effective range of products that meet clients specifications. We assure customers of timely shipping of goods and ensure best prices that match with their requirements.